Years ago, when our neighbor’s young German Shepherd left to enter military school, we were reminded that dogs have bravely served alongside their masters and mistresses for centuries… Of course, most did not have the benefit of intense special training that our youthful friend had. And then, there was Stubby, who famously served in WWI. He, too, strayed into his future when he wandered onto a playing field at Yale University, perhaps looking for some easy-going fun. Instead, he found the 102nd Infantry doing exercises, and decided to join up, on the spot! He allied himself with Corporal J. Robert Conroy. 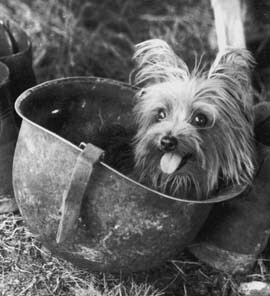 Together, they served on the front lines in France, where an alert Stubby captured a German spy by chomping on the seat of his baggy britches. Grrrrr….. Don’t mess with Stubby! This brave Pit Bull was awarded many medals and eventually met three (!) Presidents, but his real reward was Mr. Conroy’s lifelong devotion. “My heroes,” Cooper says, with awe. “A wag of the tail and our eternal gratitude to you!” When Stubby died in 1926, The New York Times published a memorable obituary of this brave pooch. So, on this Memorial Day 2010, Cooper and Swirl honor all the brave men and women, living and dead, who have served with such generosity of spirit. 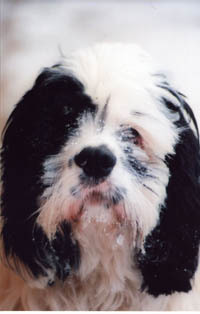 And a wag of the tail to their steadfast 4-legged friends, who faithfully serve at their side.